This is a bit of an unusual post today but I wanted to talk about the L'Oreal Kids Tangle Tamer for Wet & Dry Hair, which isn't revolutionary and going to change your hair by any means but it is cheap and does a really good job at helping to get a brush through tangled hair, I particularly suffer with tangled hair when it's just washed and wet but since introducing this and the Denman Tangle Teezer into my routine, it's been so much easier to brush my hair and has ultimately benefited to the overall condition and health of my hair. It smells amazing, it's got a sweet pear scent which is delicious and because it's targeted at kids hair, it's not too heavy and won't weigh hair down, I particularly like it because I can still go in with other products like a mousse or thickening spray without having a build up of product in my hair. It can also be used on dry hair, although I haven't had to try it on dry hair yet so can't comment on how well this works but I would imagine it works as well. It's not the best packaging and the lid falls off all the flipping time but it is only £2.19 and I've spotted it on offer before as well so keep an eye out in Boots or Superdrug for offers. It's a short and sweet post but to be honest, there is only so much you can say about this kind of product, it works well, is nice and light and smells yummy. What's your favourite leave in spray? 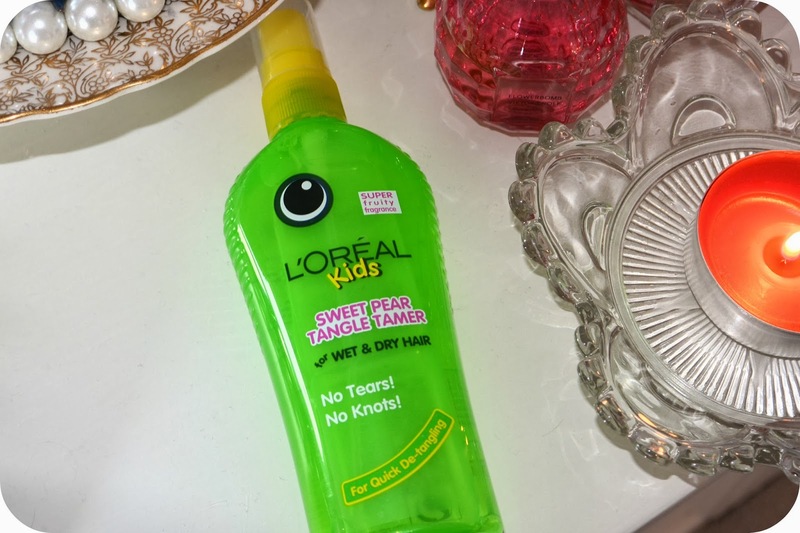 2 comments on "Review // L'Oreal Kids Tangle Tamer - Sweet Pear"
i used to love this spray when i was younger and i'm very tempted to buy it again after reading this and remembering that smell! i love the yuko leave in conditioner which i got at a company event, it smells amazing as well! I really want to get this just so I can feel happy about owning it after my mummabear never bought it me as a child! And if it works with my hair - BONUS.